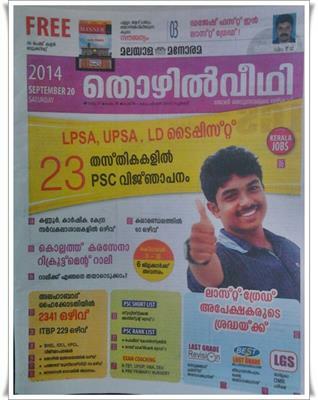 Malayala Manorama Thozhilveedhi, one of the popular employment newspaper in Kerala has published the 20th September issue. The current edition of 'Thozhilveedhi' comes with rising prospects and job opportunities in different fields. In the 13th September issue of Thozhilveedhi one can find the latest Kerala PSC notifications, vacancies in Kannur, Agricultural and Central Universities, opening in IPBP, Kerala Kalamandalam, Allahabad Court, BHEL, IOCL, HPCL and Masagon Dock. While going through the pages, readers can find new job prospects like 60 in Kerala Kalamandalam, 2341 in Allahabad Court, 229 in ITBP, 99 in GAIL, 52 in SBI, 113 in RGPV, Masagon Dock, and 69 in KMML. The latest Kerala PSC notification on 23 posts, notifications of BHEL, IOCL, HPCL are also featured in the current issue. A detailed report on the upcoming Army Recruitment Rally to be held in Kollam is given with prominence. The PSC shortlist of Statistical Assistant Grade 2 and PSC rank lists of Police Constable and Lab Technical Grade 2 exams have also found place in the latest edition of Thozhilveedhi. Lakshya Academy and Nedumangadu Friends has yet again taken initiative to give out the last time preparation for the upcoming Last Grade exam. Crash coaching for K-TET, LP/UP, HAS, DEd & Pre Primary/Nursery Teacher is published in the 13th September 2014 issue of Thozhilveedhi. Articles on various topics including LGS exam preparation, Army recruitment, regular columns like Open Forum, PSC for Beginners, Syllabus of various upcoming Kerala PSC exams and Hall Ticket details are featured in the current issue. Doubts of the readers are also cleared by concerned officers. Readers can utilize the maximum from the current issue of Thozhilveedhi. 'Competitive Winner', a free booklet which is thickly packed with latest General Knowledge in capsule format is a real companion for those looking for an ext mileage in their performance. 'Thozhilveedhi' has become an exclusive platform for youngsters and enlighten them to building up a strong career.